Our lab is developing new technologies (computational and experimental) for the de novo engineering of biomolecules and their interactions (in particular, with the long-term goal of creating synthetic phages as antimicrobials). We developed a new strategy for a novel generation of synthetic regulatory networks relying on RNA instead of proteins as it occurs with conventional gene networks. Synthetic RNA molecules detect a small-molecule and transduce the signal into other RNA molecules which could be cascaded and/or combined through RNA-only pathways to finally control the expression of targeted proteins. We are programming phage and bacteria to "execute" in living cells combinatorial optimisation algorithms with the aim of creating novel biomolecules and antimicrobials. For this, we have developed a new type of directed evolution, which we call "programmable" because of its similarity with the von Neumann architecture. De novo engineering phage and phage-like antimicrobials against even unculturable pathogens. De novo engineering regulatory proteins, RNAs and their networks. 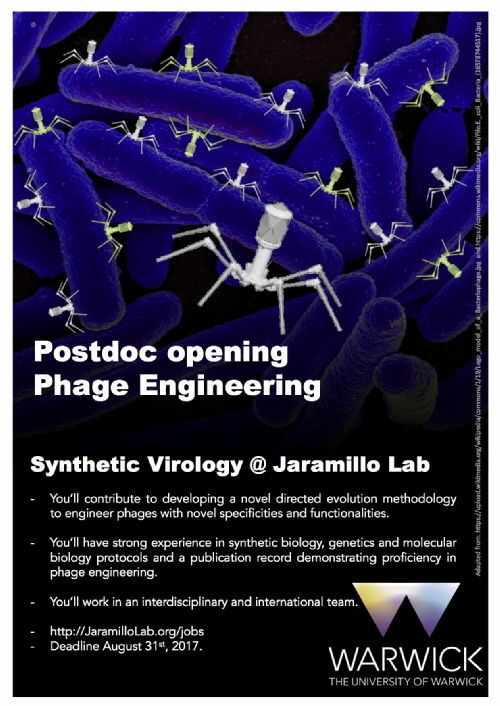 We are looking for strongly motivated and talented people willing to contribute developing a disruptive methodology to create new molecules and phages different to anything known ("de novo"). In particular, we aim to create a new generation of personalized antimicrobials based on synthetic phages.